We’ve had some family members face some pretty serious health issues as of late and had some of our own. Of course when these things creep up on us and surprise us, we look for everything we can do to overcome it. You many have heard of all the health benefits of juicing, and to make Green Juice and other healthy juices requires a good juicer to do it right. But there are some important things you need to know about this juicer before buying. We’ve gotten our money’s worth out of using this machine day after day. The Breville has a 1000-watt or 1 1/3 horsepower motor that can move at 13,000 RPM, so we’re talking major power and speed. In the video, they were stuffing in whole apples, 3 carrots at a time, and pineapple with the rind. And juice came out instantly! You can have an 8 oz glass of fresh, healthy juice in 5 seconds flat. That’s super fast! It extracts juice out of Apples and hard fruit like they’re nothing. Side note: We don’t use the Breville bags, we just line the pulp collector with a grocery bag for easy cleanup. How fast and powerful is the Juice Fountain? High Setting (13,000 RPM) – for hard fruits and vegetables, such as carrots and apples. It’s even powerful enough to juice pineapple with the rind. You don’t have to wear out your fingers with excessive peeling and cutting, and it saves loads of time. Low Setting (6,500 RPM) – for soft fruits, such as cantaloupe, oranges, and leafy vegetables. The Breville Juice Extractor is also equipped with an electronic “smart chip” that regulates power to the blades depending on what you are pureeing. It gives extra power when you put in your carrot, then slows back down for the pear. It varies depending on the juice load. This is so important because it produces just the right mix making a superior drink compared to other juicers. How Durable is the Breville Juice Extractor? The Breville Juice Fountain Elite is made of tough stuff. It’s got a die-cast steel housing, and the parts are stainless-steel. Look awesome (it looks so good in the kitchen). Stronger and much more durable than juicers made of plastic. The plastic juicers I’ve tried in the past just wouldn’t cut it. Plastic juicers are easily stained from vegetable juice and the plastic parts eventually crack from too much strain. Neither of these are issues with the Breville 800 JEXL. The stainless steel on the Breville is tough, and because it’s so sturdy and solid it easily handles the pressure. We had tried an older juicer made of plastic and it stained pretty bad, the Breville hasn’t stained because it’s…well…stainless. Compared to other juicers, you won’t get tired arms because the powerful motor does the work. You just put in the items you want to juice. The cutter is a titanium-plated, stainless-steel disc, encasing 115 dual-action, diagonal knife blades–Does that sound cool, or what?. The micromesh filter is also made of stainless steel. I don’t anticipate that wearing out any too soon. The Breville 800JEXL has speed, strength, durability, and longevity. The look is sleek and sophisticated. It’s a juicer that lasts. It’s also one that the family loves to comment about when they come over because the design is so elegant and it makes juices so fast. The juicer is powerful and easily processes rinds so you don’t have to peel. That makes it soooo easy to make juice in seconds. What about chopping? The feed tube is circular and three inches across to accommodate whole fruits and vegetables, and easily fits a whole apple or orange! I just couldn’t believe it when I saw you could put whole fruits and vegetables in the juicer. This is an important feature for me because I have Rheumatoid Arthritis, and it’s sometimes difficult for me to peel and chop all that produce. But thankfully, I won’t need to spend the time or effort with this powerful juicer. It’s really simple the way the juice extractor works. The feed tube is located on the top of the juicer. Put the fruit or vegetable in the tube, guide it down with the pusher, and from there it passes through the cutter. 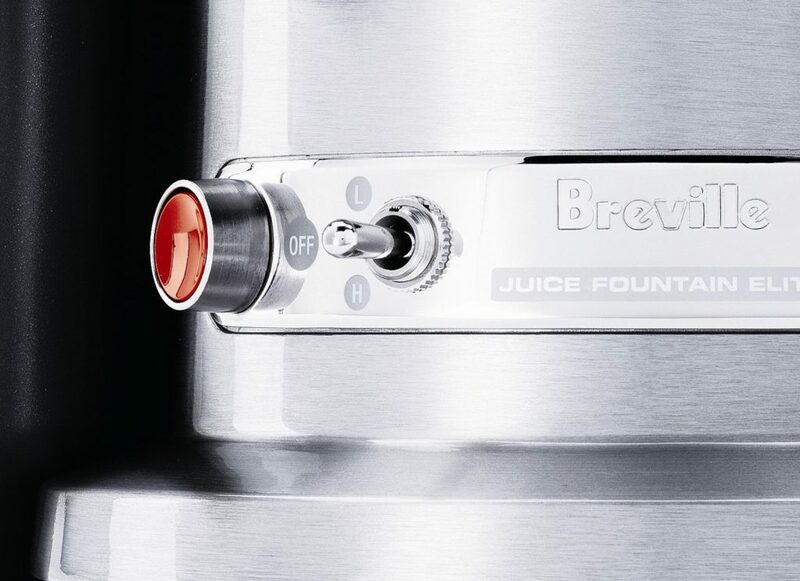 The Breville Juice Fountain has the feed tube centered right over the cutter so it can process large amounts of fruits and vegetables instantly. After going through the cutter, the pulp is then forced against the stainless-steel micro-mesh filter, pressing out as much juice as it possibly can. The residue, which is less than you would think, is then extracted into the pulp container. So much of the juice is extracted from the fruits and veggies that the left-over pulp is surprisingly dry. You can tell by the pulp that the Breville 800JEXL is nothing shore of awesome. When I was investigating at first, I saw lots of reviewers raving about the smooth and virtually pulp-free juice. What’s Included with the Breville 800JEXL? Pulp container to catch the residue. It’s large and holds up to 100 fluid ounces so you can make lots of juice without having to constantly empty the residue. Juicing pitcher that catches the good stuff. It holds 34 fluid ounces (or 1 liter) and has measurement markings on the side. It is made of clear plastic and has a handle and a spout. It also has an opening to insert the spout on the juicer where the juice comes out so there is no overspray. Watch for the “MAX” fill marking–look out, it fills up faster than you realize! Defrother to go on the pitcher. The 800 JEXL is so fast and powerful, it can produce a lot of froth. The de-frother is a nice addition because you can get rid of any froth you don’t want. Recipe Book with the user manual, to help you know what’s going to taste good together. Being a newbie juicer, I welcome all the tips I can get. Scrub brush, a good, stiff one to scrub out the mesh filter and cutting blades. Who wants a Messy Clean-up? Not me. These parts are dishwasher-safe! That makes clean up easier than ever. If you choose to hand-wash the parts, use the scrubber brush that comes with the Breville Juice Fountain to make it easier to get all the pulp off the mesh filter and other parts. The smooth, stainless-steel parts make for easy clean-up, and the assembly/disassembly is a cinch. The parts easily clamp down, so you don’t have to worry about screwing things apart like with other juicers. A hint that will save you some effort: Wash the juicer immediately after use, before the pulp has a chance to dry and harden. One more hint: You can line the pulp catching container with a plastic bag, so when you’re done, you simply throw away the residue. One less dish to wash! Where to Store the Juice Fountain? Before deciding on a juicer, I pictured where in my home this would go–probably on a counter corner because we would use it almost every morning. It’s sleek, sophisticated, and it’s the perfect addition to the kitchen. If you do happen to have any trouble the Breville 800JEXL Juice Fountain Elite includes a 1 year warranty, so you can rest at ease knowing you’ll be taken care of. A lot of people are talking about the Breville Juice Extractor to the tune of 2,240 customer reviews on Amazon alone! 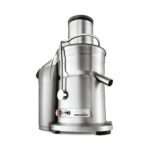 Buyers of the Juice Extractor have rated it with an average of 4.5 out of 5 stars on both Amazon.com and the Breville website too. It was a lot of fun to see a number of juicer owners say that if their house were on fire, their Breville juicer would be one thing for sure that they’d save. Breville explains that one minor issue comes when you quickly feed several fruits or veggies with high water content through the juice extractor. Sometimes a little juice leaks out between the juicer cover and the filter bowl. This is because the juice is extracted so quickly that the force may cause a bit of leaking. So, if this happens, just make sure the juicer is on low speed and press the food pusher down more slowly. Then you shouldn’t have any more leaking problems. One person mentioned she had a little juice flowing back into the pulp-catcher, but then she realized she hadn’t been cleaning her screen filter like she should have. Once she scrubbed it clean, she no longer had a problem. So be sure to use the stiff brush that’s included with your juicer to make sure the screen is clean. It’s durable, long-lasting, fast, easy cleaning, and one person mentioned how she saves money in the long run on produce because the Breville Juice Fountain extracts so much more juice than her old juicer. Less produce is wasted. The 800JEXL is not cheap, and that’s the point. It’s durable, powerful, and built to last. Cry once when buying it, then love it for a lifetime (which could end up being healthier and longer with nutritious juices). We purchased the Juice Fountain Elite, and love it to death. 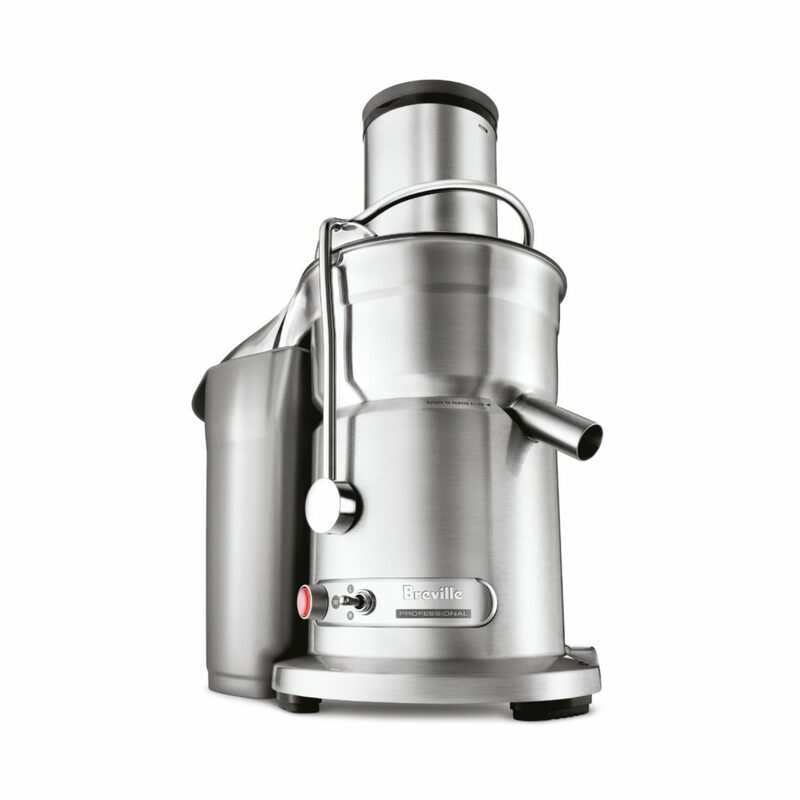 Breville is the Porsche of juicers. The health benefits are what attracted us to a juicer that can make quality juice, is easy to use and makes juice with almost no wait time. But one of the benefits of the Breville is that it’s so fast and easy to use, that means you’ll use it more, and with more use comes the better health benefits week after week! Juicing vs Blending – Is there a difference? Think of all the research that is being done and has shown how good the natural vegetable and fruit juices are for you. If those juices can help you prevent major sicknesses or maladies or just plain make you feel healthier, it’s worth it compared to the mounds of health related bills for not taking proper care of ourselves! 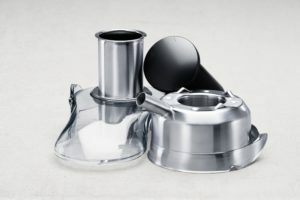 Where Can You Buy the Breville 800JEXL Juice Fountain Elite?